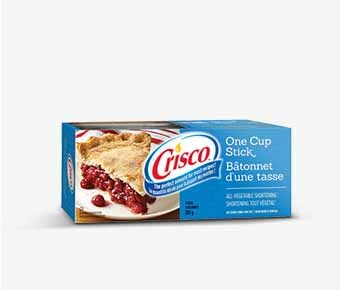 The Crisco® One Cup Stick is one cup of all-vegetable shortening, conveniently measured to be the perfect amount for most recipes, including our classic No Fail Pie Crust. WARNING: Oil/shortening will catch fire if overheated. Damage or serious burns may result. DO heat oil/shortening carefully, uncovered, on medium heat. DO reduce heat if smoking occurs. DO NOT leave unattended while heating. DO NOT refill any container with hot oil/shortening. IF OIL/SHORTENING CATCHES FIRE: DO turn off heat. DO cover pot until cooled to room temperature to avoid re-ignition. DO NOT carry pot until cool. DO NOT put water on hot or flaming oil/shortening. 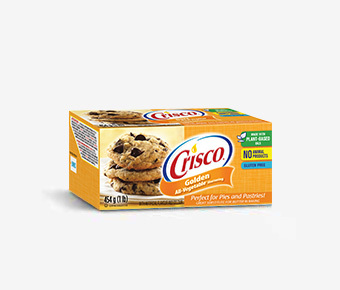 Crisco® All-Vegetable Shortening is ideal for baking and frying. Our classic No Fail Pie Crust recipe makes light and flaky pastry every time. Try Crisco shortening in your next batch of cookies to make them extra moist and tender. For frying, Crisco shortening is ideal as it doesn't burn or scorch, making your fried foods golden and delicious. Soybean Oil, Hydrogenated Palm And Soybean Oils, Mono And Diglycerides, Tbhq, Citric Acid. 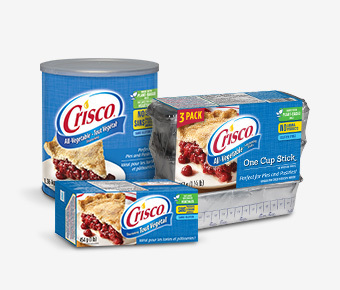 Crisco® All-Vegetable Shortening is ideal for baking and frying. For baked goods that have a buttery flavour, use Crisco Golden All-Vegetable Shortening. Shortening (Soybean Oil, Hydrogenated Palm And Soybean Oils, Mono And Diglycerides, Tbhq, Citric Acid), Artificial Flavour, Colour. For your favourite family recipes, the light taste of Crisco® Vegetable Oil allows the flavours to come through. 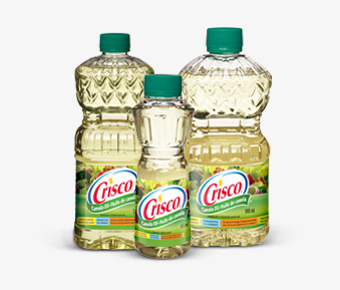 Using state-of-the-art technology, Crisco Vegetable Oil is manufactured and packaged to ensure high quality oil that doesn't add a heavy, greasy taste to the foods you love. 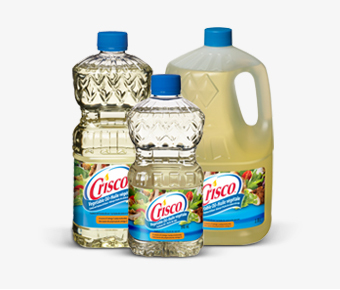 Crisco Vegetable Oil can be used for everything from sautéing and frying to baking. Crisco Vegetable Oil, like all vegetable oil, is cholesterol and sodium-free. WARNING: Oil will catch fire if overheated. Damage or serious burns may result. DO heat oil carefully, uncovered, or on medium heat. DO reduce heat if smoking occurs. DO NOT leave unattended while heating. DO NOT refill bottle with hot oil. IF OIL CATCHES FIRE: DO turn off heat. DO cover pot until cooled to room temperature to avoid reignition. DO NOT carry pot until cool. DO NOT put water in hot or flaming oil. For your favourite family recipes, the light taste of Crisco® Canola Oil allows the flavours to come through. Using state-of-the-art technology, Crisco Canola Oil is manufactured and packaged to ensure fresh, high quality oil that doesn't add a heavy, greasy taste to the foods you love. Crisco Canola Oil can be used for everything from sautéing and frying to baking. Crisco Canola Oil, like all canola oil, is cholesterol and sodium-free.